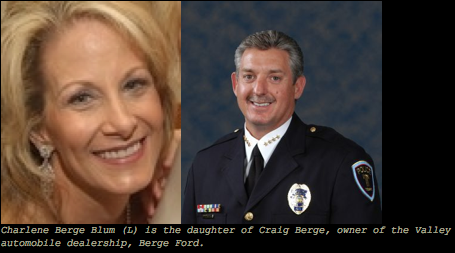 Tempe Police Chief and Berge Ford Daughter Affair? 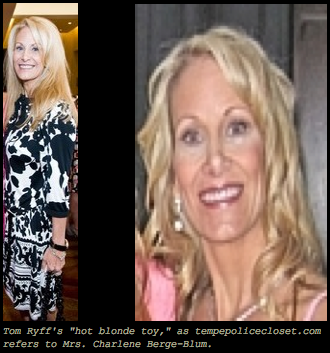 IS THIS “THE OTHER WOMAN” FOR TEMPE POLICE CHIEF TOM RYFF? Well, she is according to tempepolicecloset.com. The website, which is likely ran by former and current City of Tempe employees, says Ryff and Mrs. Charlene Berge-Blum had a “longtime, recent…inappropriate relationship.” Ryff has also told friends that he can “help them get a good deal” on cars at Berge Ford in Mesa, the website says. But the most scandalous part of this alleged affair is Ryff, according to tempepolicecloset.com, yelling, “I’m not f***ing my wife,” while talking on the phone with Berge-Blum in his police department office. Operation Nation has learned from a few 80-percent reliable sources that Berge-Blum is married to Randall E. Blum, who owns a real estate investment company (defunct) in Mesa. Ryff is also married. Does Ryff really have complete control of not only the entire City of Tempe government, but also the greater Phoenix “mainstream” media (except for CBS 5)? This entry was posted in Tempe and Maricopa County Arizona News on September 3, 2009 by admin. Cheating is now an epidemic, fueled, I suspect, by Viagra. When my husband found another, much younger woman, he started ordering Viagra from Canada. This is his second intense affair, he only recovered from the first when she said she was pg, she was only going thru menopause. Another factor that I think encourages men to cheat are all the TV ads which show couples, an old grey haired man with a much, much younger woman. What do you think. I cannot believe that he was dating (for lack of a better word) her. I hope he loses his position. Poor character is not a quality anybody wants in a police chief.